QUEBEC, Quebec - Dec. 20, 2018 - PRLog -- The first-ever Sunwing flight from Quebec City to Puerto Vallarta departed from Quebec City Jean Lesage International Airport this Monday; marking the beginning of the tour operator's seasonal weekly flight service to Puerto Vallarta which has become one of Canadian's top destinations to escape the cold winters. Flights will take place every Monday until April 15, 2019. "We celebrate this new flight to Puerto Vallarta's International Airport (PVR) as one of the results of the continuous work by the Puerto Vallarta Tourism Board in promoting the destination across the Canadian landscape," commented Javier Aranda, Director of the Puerto Vallarta Tourism Board. "Our intense promotional, advertising and public relations campaigns are fundamental to attracting new flights organically to our city." Sam Char, Executive Director for Sunwing Travel Group in Quebec, commented via a press release that "We are pleased to introduce a convenient direct flight service connecting our Quebec City customers to new and exciting destinations. Puerto Vallarta is a consistently popular choice among our vacationers and we're sure our Quebec City travellers are eager to experience Pacific Mexico's warm and friendly culture, tropical climate, captivating views and golden-sand beaches." Puerto Vallarta is one of Canada's top destination. According to the Jalisco's Tourism Ministry, in 2017, 15.62% of Puerto Vallarta's international arrivals are Canadians, the second largest source of international visitors following the United States. 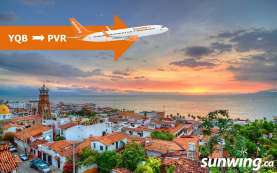 Sunwing's new route is expected to increase arrivals from the country as Puerto Vallarta now has over 40 weekly frequencies connecting Calgary, Edmonton and Vancouver by Air Canada, Transat Airlines and Westjet in addition to connecting flights by Aeromexico via Mexico City. According to the Mexico Ministry of Tourism, Mexico is Canada's top international destination after the United States and arrivals have from 842,000 in 2007 to 2 million in 2017. Other top Mexican destinations for Canadians are Cancún, La Riviera Maya and Mexico City.